Well this all looks quite nice but running things like this has some not-so-obvious limitations. As you can see the kernel binds all the daemons together and as many of the system services daemons are basically just BSD packages with minor alterations the don’t necessarily have any hooks into Juniper’s custom daemons. This combined with the fact that most network functions are actually done through the Juniper’s RPM daemon results in reliance on the base kernel functions for all the non-juniper daemons. The main issue with this is that the Kernel is not VRF/routing instance aware and exist in the simplistic world of one routing instance – default/inet.0. The implication is that all the system services must run in default/inet.0 which is something you might not want to do as that might be the default routing instance for your data plane. So if you want a total data/management/control plane separation you might have an issue. 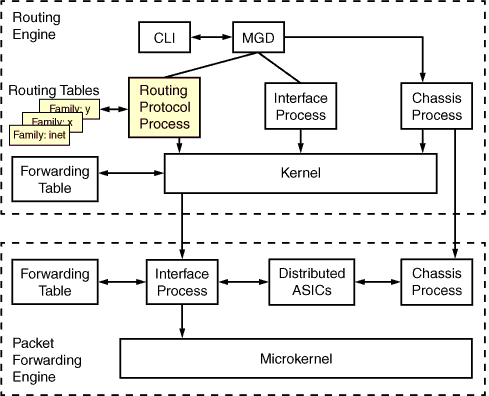 The other problem is that some features of routing protocols and or some specific configurations only work in the default routing instance (for the same reasons mentioned above). So is there a solution to this? Fortunately the answer is yes but it comes with quite a few caveats. The way how to do this is in very brief form described here but as always this doesn’t explain anything beyond the basic config I will try to provide bit more information based on my testing and deployment. So now the system daemons will actually run but as in this setup the routing instance default has no way of talking to the servers. Even though this IP is as good as any For the next step (and the last) we will need one more non-routable address. This time I used something that can appear in the routing table without too much fuzz 192.168.255.255/32. The obvious question is what is this address good for. We need it for 3 reasons. source-address—A valid IP address configured on one of the SRX Series devices. For system logging, the address is recorded as the message source in messages sent to the remote machines specified in all host hostname statements at the [edit system syslog] hierarchy level, but not for messages directed to the other Routing Engine. So this is not only confusing but outright misleading – in effect all the services above must use ipv4 address on lo0.0 as they wouldn’t just work. This source nat is using an pool with an IP address as there are multiple interfaces in the destination routing instance. The aim is to use lo0.X that exist in the instance. Even though the lo0.X should be used for the snat based on the rules the SRX platform does seem to use a bit random approach and it uses the first forwarding interface so usually ge-x/x/x This is ok if you have single uplink and you use the IP from this interface but in any other case this can result in unwanted behaviors. Using the pool fixes this issue despite the intention of it being used for different purposes. As described elsewhere the IP of the Lo0.0 must exist in the routing table of the routing instance that actually has the routes to the servers so when the packets arrive they will be forwarded to lo0.0 and the system will process them. The NAT will not take place even though it should. The reason lies within the NAT being prioritized in different way if you source traffic from the srx itself which is always the case for the above mentioned services. This is it – no direct access to default routing instance while the services can still be sourced from it. The question is if it is worth the hassle and I would say for most cases: no, it is not. But if you have some corner case or you need to have an added layer of security then this is the way to do it. On a side note – management VRF as a separate routing instance has been finally introduced in the 17.3 releases but as far as I know this only applies to new kit with VM architecture – especially the MX series.